One of my favorite year-end lists has been published in the January issue of Charlotte magazine. 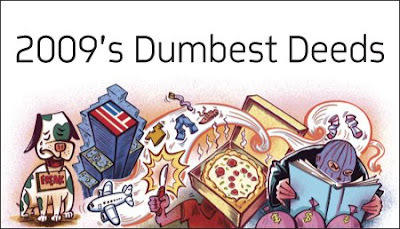 The 2009 Cracked Crowns recap the year's dumbest and most dubious events in Charlotte. I've had the honor of being one of the contributing writers of the list for the past five years and not only is it fun to write, but it's also intriguing to be reminded of just how much can transpire over the course of a year. I think my favorite Cracked Crown this year is the one about the two local Domino Pizza workers who videotaped themselves doing disgusting things with food and even more idiotically posted the video on YouTube. If you'll recall, that story made national headlines. Read about that and more by clicking here.